Paying homage to the success of the Audi TT since its series introduction, the TT 20th Anniversary Edition includes details inspired by the TTS Roadster concept study that premiered at the 1995 Tokyo Motor Show. In addition to two exclusive exterior paint colors, the TT 20th Anniversary Edition features high-gloss black exterior trim elements and unique 19 inch 5-arm-design gunmetal wheels with summer tires. A trumpet-style stainless steel exhaust is exclusive to the model, accompanied by OLED taillights currently only available on the TT RS. 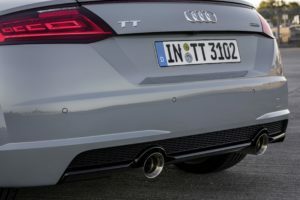 “20 Years of TT” badges adorn the front fenders, alongside matte finish Audi rings etched into the rear sills. Inside, the S Sport seats, door armrests, steering wheel, and center console are upholstered in Mocassin Brown Fine Nappa leather finished with bespoke yellow contrast stitching for a modern interpretation of the distinguished “baseball” stitching in the original TT. Interior badges denoting the vehicle’s unique production number alongside a “TT 20 Years” icon mark the vehicle’s exclusive status. 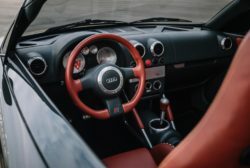 From design icon to driving machine, the Audi TT 20th Anniversary Edition features a 2.0 liter four-cylinder turbocharged engine with 228 horsepower and a standard seven-speed S tronic dual-clutch transmission. The coupe can sprint from 0-60 mph in 5.2 seconds, with the roadster achieving the same in 5.5 seconds. 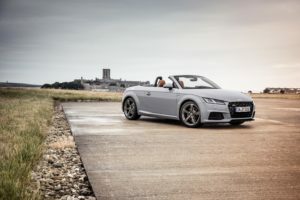 The TT 20th Anniversary Edition includes the new innovative technology and connectivity features seen in other 2019 Audi TT models, including standard Audi phone box with wireless charging and signal booster. All TT 20th Anniversary Edition models come equipped with the Technology package, including Audi virtual cockpit, MMI navigation plus, Audi smartphone integration (Apple CarPlay and Android Auto), Bang & Olufsen® Sound System, and Audi side assist. The Audi TT 20th Anniversary Edition is on sale now with an MSRP of $52,900 plus destination for the coupe, and $56,800 plus destination for the roadster. MMI Navigation plus depends on signals from the worldwide Global Positioning Satellite network. The vehicle’s electrical system, and existing wireless and satellite technologies, must be available and operating properly for the system to function. The system is designed to provide you with suggested routes in locating addresses, destination and other points of interest. Changes in street names, construction zones, traffic flow, points of interest and other road system changes are beyond the control of Audi of America, Inc. Complete detailed mapping of lanes, roads, streets, toll roads, highways, etc., is not possible, therefore you may encounter discrepancies between the mapping and your actual location. Please rely on your individual judgment in determining whether or not to follow a suggested MMI Navigation plus route. Driver Assistance features are not substitute for attentive driving. See Owner’s Manual for further details, and important limitations.